The choice of fabric on which you are going to stitch is very personal and depends on the design, how you are going to use the piece, your personal preference etc. Because Aida is a “blockweave” fabric, the holes through which you stitch are very apparent which makes stitching faster than on an evenweave. However, if the design you are stitching does not cover the whole of the fabric, these holes may detract from the finished appearance of the piece, since they are visible. The higher the count of the Aida, the smaller and less apparent are the holes. Fractional stitches and backstitch are less easy on Aida than on evenweave or linen and you may need to switch to an embroidery or “sharp” needle to make them easier. Aida may be 100% cotton, a cotton/man-made fibre blend or 100% man-made fibre. The less man-made fibre, the softer the Aida is likely to feel. The threads of evenweave are spun so that they are the same thickness all along their length. They are also spaced evenly from each other on both warp and weft (vertical and horizontal). You can work over single threads in the fabric, or (more usually over 2 threads. Working on evenweave is slightly slower than on Aida. If the design you are stitching does not cover the whole of the fabric, the finished appearance is more attractive to some people because there are no obvious holes and blocks of fabric. Some people prefer the feel and/or appearance of evenweave. Fractional stitches and back stitch are easier on evenweave. Evenweave may be 100% cotton, a cotton/man-made fibre blend or 100% man-made fibre. This is an evenweave fabric made from natural linen threads where the threads are spaced evenly from each other but, because of the nature if linen, the threads may vary in thickness along their length. This gives a more rustic or antique look to the finished piece of work. Working on linen is slightly slower than on Aida. If the design you are stitching does not cover the whole of the fabric, the finished appearance is more attractive to some people because there are no obvious holes and blocks of fabric. If you are stitching an antique style sampler, it will look more “authentic” on linen. Some people prefer the feel of linen, which tends to be softer than either Aida or evenweave. Linen fabric is almost always 100% natural. If the design you are stitching completely covers the fabric and does not use fractional stitches or back stitch, then there is little or no advantage in stitching on linen/eveneave (unless you enjoy the feel of the material) – use Aida it will be faster. This is usually 22 count evenweave. It can be used for cross stitch (stitching over either 1 or 2 thread)s but is mainly used for pulled or drawn thread work eg Hardanger work. Hardanger may be 100% cotton, a cotton/man-made fibre blend or 100% man-made fibre. Some designs are not suitable for Aida. This is usually because there are lots of fractional stitches or a part of the design (eg a face) may be stitched over one strand of linen or evenweave to provide finer detail. If a chart recommends linen or evenweave check why before you decide to stitch it on Aida to avoid disappointment when you get to the area which will just not work on Aida. Stitch in a very good light. Spread a piece of white material on your lap. Use an illuminated lap tray. FAQ’s: How do we begin and end the embroidery thread? As Emphasized by Gail in our last meeting…Noooooooo Knots!!!!! So how do we begin and end the thread? In an embroidery project lot of time and efforts are put in right from the first stitch. This very first stitch starts with a knot, but this knot cannot be a permanent fixture. Knots make the back side of embroidery untidy, bumpy and at times can unravel with the use our laundering. I always try to do the best work possible when putting time and effort into an embroidery project, starting with the first stitch. Thus spoiling the precious embroidered work. An away knot is a temporary knot used to start an embroidery thread. It can be easier to use in embroidery than a waste knot, because you don’t have to stitch over the starting end of the embroidery thread to secure it while you stitch. Instead, the starting end of the thread is left in the work away from the stitching (hence it’s off name). Click here for a detail photo tutorial on AWAY KNOT. A waste knot – like its cousin, an away knot – is a temporary knot used to start an embroidery thread. The thread is secured by stitching over a tail of thread, and the knot is clipped from the fabric after the stitching has been completed. Click here for a detail photo tutorial on WASTE KNOT. Take your needle to the back of the fabric and run under the few stitches. Then gently pull the needle through and snip the thread. It is all worth to put in those little extra moments to start and end your embroidery work. FAQ’s: What is the best needle size to use on tapestry and on cross-stitch? Answer by Gail: The type of needle depends more upon the fabric than the technique. Counted cross stitch should be done with a tapestry needle. Tapestry needles have blunt points and much larger eyes than sewing needles. The blunt points prevent the needles from piercing fabric threads. Fabric is measured in holes per inches (HPI). When using even weave fabric don’t forget you will sew over two threads so a 28 count HPI fabric will end up being stitched at a rate of 14 HPI. If you are doing cross stitch on 14 HPI count then a tapestry needle (or “blunts” they are sometimes called) sized 26 or 24 is better. On a fabric with a count of 18 use a size 26 – the bigger the number the smaller the size needle. Really fine work such as 24 HPI needs a size 30 or smaller. One traditional rule says you should use a #22 needle if the fabric is 14 count (14 threads per inch) or less, a #24 or #26 needle if the fabric count is 16-18 count, and a #26 needle if the fabric is finer than 18. I use a size 20 or 22 on tapestry as the fabric is usually 10 or 12 HPI. The choice between the two comes down to wool thickness and eye of the needle. I personally use a 26 in preference to 24 when sewing on 14 HPI although it is a little harder to thread. The usual “rule” holds–find a size (or sizes) you like. Needles come in a variety of types and sizes. The size of a needle is given as a number. The higher the number, the finer the needle. Ideally, the shaft of the needle should be of a similar thickness to the thread being used. The thread should fill the hole left by the needle when it passes through the fabric. A thick needle with a large eye. Similar to a tapestry needle but with a sharp tip. This needle was originally used for tufted chenille yarns. Suitable for thick threads such as tapestry wool, crewel wool, six strands of stranded cotton, no.3 and no. 5 perle cotton, thick silk and heavy metallic thread. Ideal for ribbon embroidery and wool embroidery. A finer needle with a large, long eye. The large eye makes the needle easier to thread. Sizes 7-9 are ideal for smocking. 3 – 8 Suitable for fine embroidery using one or two strands of cotton, silk or rayon. Unsuitable for bullion knots as the eye is too wide.Excellent general purpose needles. Use with three to six strands of stranded cotton, silk or rayon and cotton a broder (twisted, non-divisible cotton thread), broder medicis (fine wool thread), no.8 and no.12 perle cotton and fine metallic thread. 7 – 9 Suitable for fine embroidery including bullion knots. Use with one or two strands of stranded cotton, silk or rayon. The no.12 is sometimes known as a hand applique needle.Use with two or three strands of stranded cotton, silk or rayon. Also suitable for bullion knots. These are fabulous for bullions. 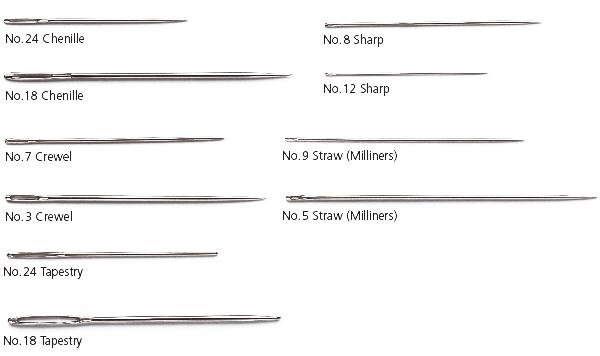 A straw needle has tiny eye and a long, fine shaft. Because the eye is no wider than the shaft, they are invaluable for beading and for pulling through the wraps when stitching bullion knots. Traditionally used for work on bonnets and hats. 1 – 4 Use with one or two strands of stranded cotton, silk or rayon.Use with three or four strands of stranded cotton, silk or rayon.Use with four to six strands of stranded cotton, silk or rayon, no.8 and no.12 perle cotton, cotton a border and metallic threads. Also suitable for Brazilian embroidery using thick, twisted threads. A medium length needle with a thick shaft, a blunt tip and a long eye. The blunt tip parts the fabric threads rather than splitting them. Suitable for decorative hem stitching on fine linens, fine counted cross stitch and petit point.Suitable for counted thread embroidery such as cross stitch, blackwork, pulled and drawn thread work and Hardanger. Also suitable for wool embroidery, needleweaving and shadow work. Needles lose their finish over time which makes them more difficult to use. Special finishes, such as gold and platinum, are available. They cost more but some find they last longer. Try different finishes until you find the one that works best for you.